UPDATE: On March 25, 2019 the City of Charleston Department of Stormwater Management, together with JMT, hosted a non-mandatory information meeting to present Phase 1 of the Reconstruction of the Low Battery (Murray Blvd from Tradd St to just beyond Ashley Blvd). Click here for the presentation material. The Low Battery was constructed as part of a large land reclamation project undertaken in two phases: The first section (1909-1911) extended from Tradd Street to King Street. The second phase (1917-1919) extended from King Street to the “Turn” at the intersection with East Battery Street. The concrete wall of the Low Battery was constructed on a timber deck supported by timber pilings. The seaward face of the Low Battery is skirted with concrete panels attached to timber sheeting and batter piles. This system formed a retaining wall system to retain the landside fill. The High Battery consists of two (2) distinct designs: The original High Battery (reconstructed in 1893-1894) is comprised of a stone wall (seaward) backed by two (2) masonry/concrete walls approximately 10 feet apart. The space between the two walls is backfilled with soil and the top is capped with stone slabs to create a walkway or promenade. The second part of the High Battery, “The Turn,” was constructed in 1919. This portion of the Battery connected the High Battery to the Low Battery, creating a continuous seawall from north of Water Street to just south of Tradd Street. Construction of the “Turn” used methods very similar to those used in the construction of the Low Battery. The repair of the “Turn” is the first phase of the overall seawall repair project and has been completed. A “Seawall Evaluation and Study” prepared by Cummings & McCrady evaluated the condition of the Low Battery wall in 2004 and presented potential repair methods and an estimate of probable cost. Due to the time elapsed since the study was conducted, an updated evaluation of the wall and recommendations for repair/rehabilitation are required. 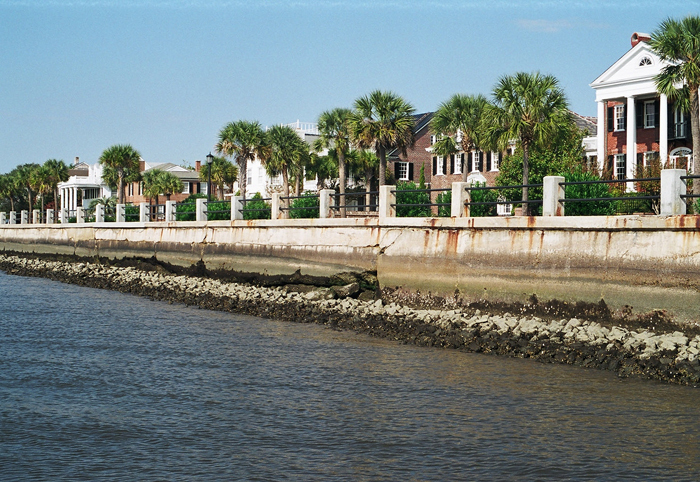 The City of Charleston, using the Qualifications Based Selection (QBS) process solicited statements of qualifications from individuals or firms wishing to provide consultant services for the next phase of the Battery seawall repair and rehabilitation project. Based on this detailed process, the City determined the team led by Johnson, Mirmiran & Thompson (JMT) was the most qualified to perform the requested services. The City entered into a contract with JMT to perform the initial evaluation and design phase of the project. For additional project information, please see the Design Center webpage.